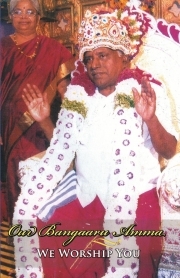 Description of "Our Bangaaru Amma 4 (eBook)"
At Mel Maruvathur Temple, situated in the Kanchipuram district, almost ninety kilometres from Chennai, on the Chennai-Thiruchi National Highway, reside twenty-one Siddhars (Saints), who have attained Jeeva Samadhi (Liberation, or Moksha) and opted to remain on Earth for the benefit of mankind. In Malsya Puranam, this place is referred to as ‘Siddhar Vanam’ (the forest, in which the Siddhars dwell). In this holy place, where twenty one great Siddhars reside, the Divine Mother Annai Adi Parasakthi - God - has incarnated in the form of Her Son, Arulthiru Bangaaru Adigalaar. Affectionately known as Amma to Her devotees, Amma and Annai Adi Parasakthi are One. He (Amma) is She (Divine Mother) and She is He! Amma is Adigalaar! Adigalaar is Amma! Amma is God Incarnate! In this holy place, at Mel Maruvathur Adi Parasakthi Siddhar Peetam, millions of devotees offer their prayers, humble salutations, and requests at the Divine Feet of Arulthiru Adigalaar Amma and by Her grace, their wishes are fulfilled and their lives rendered happy. For spiritual aspirants and those, who desire to walk on the spiritual path, Adigalaar Amma is the Sadguru (God, who comes as the Guru, or Supreme Teacher). She guides, blesses, and protects them on the spiritual path and ensures their rapid spiritual progress. 'Sakthi Olhi' is a magazine, which is published at Mel Maruvathur according to the advice given by the Divine Mother. This magazine, published in Tamil, Telugu, and Kannada at the time of the writing of this book, contains accounts of devotees' experiences, Amma's oracles, and other priceless spiritual advice and literature. "Our Bangaaru Amma 4: We Worship You" is the fourth book, in a series of books, to be published by Angel Grove Studio. This book contains the English translations of devotees' experiences, from the Sakthi Olhi magazine, from January, 2005 to December, 2005. We know that you, our dearest readers, will derive great pleasure from reading about the first-hand experiences of Amma's devotees. We pray that this book will guide you on the path of faith and the road towards God, especially in these times, when humanity, human values, brotherhood, and harmony have become absolutely essential and are of utmost importance, for our survival, progress, and prosperity. Om Sakthi! Sairam! Namah Shivaya! Jaidev Kesavan is the creator and owner of Angel Grove Studio, India. AGS, India is an organisation, which seeks to blend social service with business and passion with compassion. Through its social service and beneficial business activities, Angel Grove Studio desires to contribute in a small way towards the peace, happiness, progress, and prosperity of its fellow human beings. The author, Jaidev Kesavan, is an English language trainer by profession and a teacher, who also writes English fantasy and science fiction books. He also compiles spiritual books and "Our Bangaaru Amma 4: We Worship You" is the fourth in a long line of books to come. Reviews of "Our Bangaaru Amma 4 (eBook)"